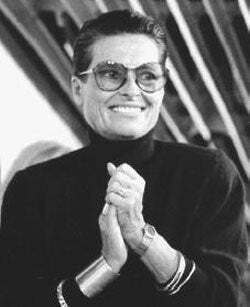 As we mentioned earlier today, Liz Claiborne has passed away. Thing is, some of us didn't have much to say about her, other than that we vaguely recall coveting a sweater she designed sometime in the mid-80s. And maybe she had a popular fragrance? Who knows — we're fashion idiots! Luckily, Jezebel's Jen Gerson is not such an idiot, and she has both put things in a little more perspective ('Little House' reference) and created a pretty gallery of Claiborne designs through the ages. Liz Claiborne perfected what I like to call Little House on the Prairie style: There were the formless floral dresses, the occasional crocheted topper, a denim shirt here, a chino there. It was never my taste, but I respected it because was adaptable sportswear that women could actually wear. There was no Balenciaga architecture, no Comme des Garcons intellectualism, no Gucci (ca. Tom Ford) provocativeness: These were real clothes for real women, items that could be easily mixed and matched and worn to work or to lunch or to your kid's T-ball game on a Sunday. There was great fluidity in their potential to transition from one event to the other, in an unintimidating, egalitarian fashion. Liz Claiborne knew not of snobbery. The past six months, though, have been perhaps the most exciting in the company's history. True, the company achieved its most booming success during the 80's and early 90's, but this past year has seen massive changes at a macro level, from business to design. New CEO William L. McComb is changing the business structuring (who reports to who and such) almost as dramatically as Creative Director Richard Ostell and Chief Creative Officer Tim Gunn (of Project Runway fame) are changing the silhouettes and palette of the iconic brand. The Little House days have reached an end as sleek silhouettes and a dark monochrome palette move in. This ain't your mama's Liz Claiborne. And so the woman who started it all leaves behind a company as fundamental to the contemporary American woman as ever, with a new eye to the a refining of what makes these classics so classic.